It’s almost summer, so what could be better than getting out the swim gear and making your way to the waterpark for some fun? Well, how about adding a few world class DJs to that? That’s what we have with Arizona’s latest version of Wet Electric, taking place next weekend, April 25-26 at the Big Surf Waterpark in Tempe, AZ. 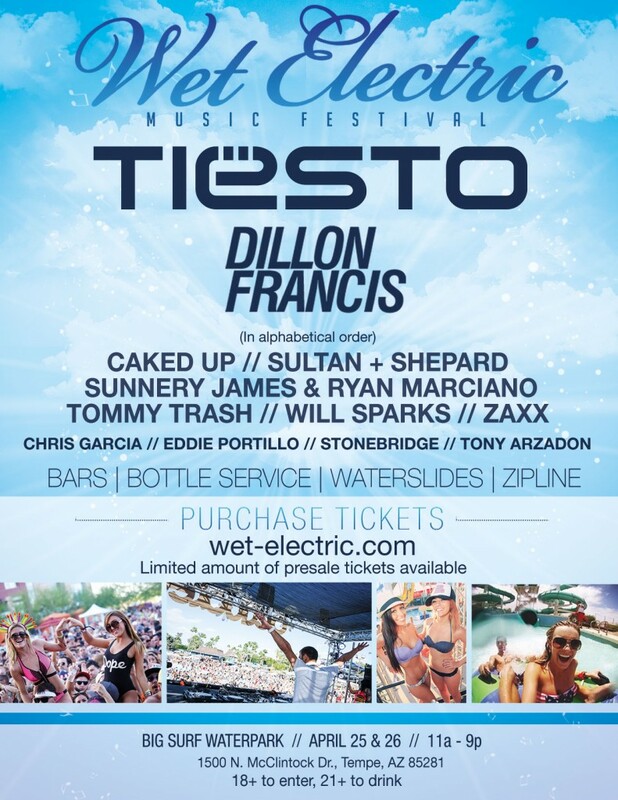 Taking place over two 10 hour days, Wet Electric is the best way to stay cool in the Arizona heat and enjoy awesome DJs such as Tiesto, Dillon Francis, Tommy Trash, Will Sparks and more! Wet Electric tickets are still available here. Two day GA and VIP passes are still available, as well as single day “chill packs” which include some extras for both Saturday or Sunday admission. Right now, Wet Electric is offering a great deal where if you buy 3 two-day passes, you get the 4th for free, so make sure to round up your friends and make it a fun weekend at the waterpark! Check out some of the music that will be featured at Wet Electric below!